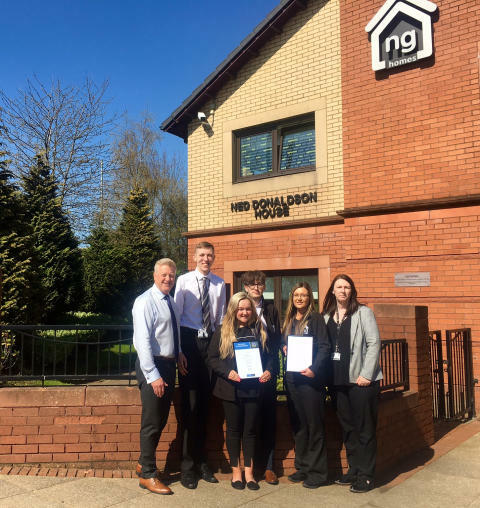 ng homes is delighted to announce that it has been awarded Investors in Young People (IIYP) Gold status. The Association was assessed against the wider Advanced Framework and Investors in People Scotland (now Remarkable) conducted the review over two days during March. “We currently have the Investors in People Gold and Health & Wellbeing Awards and we have also had Investors in Young People recognition in place since 2016. At this time we felt ready to be assessed against the Advanced Framework and we are delighted that this has resulted in the IIYP Gold Award. Strengths highlighted include the organisation’s values being at the heart of our approach to supporting young people and the Association’s strong commitment to young people both externally across our communities and internally around the opportunities we offer.Other key strengths identified were our clear strategy for developing young people which includes; qualifications, on-the-job learning and mentoring, and managers who are seen as role models who are committed to developing young people. Stage 1 Understood: The appropriate principles and practices are in place and communicated. Young people and Leaders know what is expected of them. Stage 2 Embedded: Young people and Leaders are actively engaged in ensuring the appropriateness and consistency of the principles and practices.